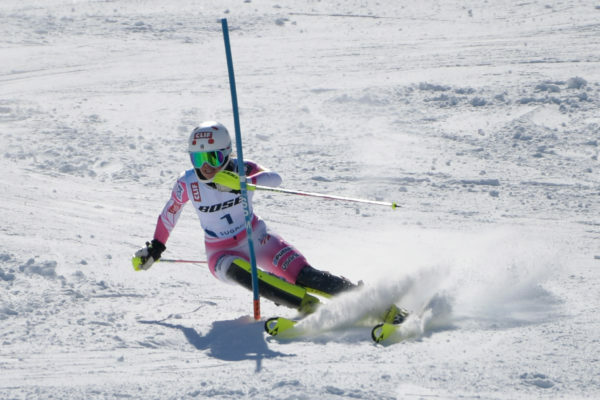 Lila Lapanja (USA) during the Women's Slalom ski race at Sugarloaf Mountain Resort, March 26, 2017. Lapaja finished third in the event. PORTLAND, Maine — The owners of Sunday River and Sugarloaf ski resorts have approved selling the properties to other investors. The sale should mean relatively little for skiers, as the properties still are under a lease with operator Boyne Resorts for more than 30 years. CNL Lifestyle Properties announced March 24 that its shareholders approved liquidating all of the real estate investment trust’s assets, selling off 14 ski resorts that also include Mount Sunapee and Loon Mountain in New Hampshire, and Okemo Mountain Resort in Vermont. CNL said that it expects the sale should close later this month. The Associated Press reported in November that the deal is the largest ski resort transaction in the history of the sport. The $830 million liquidation deal will give 14 ski areas to Ski Resort Holdings LLC, owned by Och-Ziff Real Estate. EPR Properties will get 15 of CNL’s other amusement parks and water parks. The company did not disclose sale values for specific assets in filings with the U.S. Securities and Exchange Commission. Boyne bought both resorts in 2007 from American Skiing Co. and then sold the land and physical assets to CNL. Boyne has invested millions of dollars in the resorts since the acquisition. CNL reported that it had a better start this winter than during the 2015-2016 season, with fourth quarter ski revenues up 11.8 percent “primarily due to ample natural snowfall at most Western ski resorts and favorable snowmaking conditions at Northeastern resorts. “Much of the revenue gains for the ski portfolio came from the Northeastern region, where the fourth quarter of 2015 saw many of those resorts opening late and with limited terrain due to the poor weather conditions to start the season,” the company said in its latest annual report.